I’ll have what that child’s having. After the dinosaur brothers Bub and Bob destroyed the villainous Super Drunk at the end of Bubble Bobble, their prehistoric flesh dissolved to reveal that they were human after all. Elated that they no longer resembled dinosaur knockoffs from a Walgreens coloring book, the brothers took their new fleshly frames to Rainbow Islands, where they hoped to relax after two hundred grueling levels of co-op hell. When they arrived at the color-drenched island chain, however, they learned that an entity known as the Dark Shadow seized control of the territory. Only the brothers, with their ability to conjure deadly rainbows out of the languid tropical atmosphere, can restore the islands to their former playfulness. We’re off to a Tolkien start! And with that outlandish story, Rainbow Islands Extra drops you right into its eerily cheerful setting. 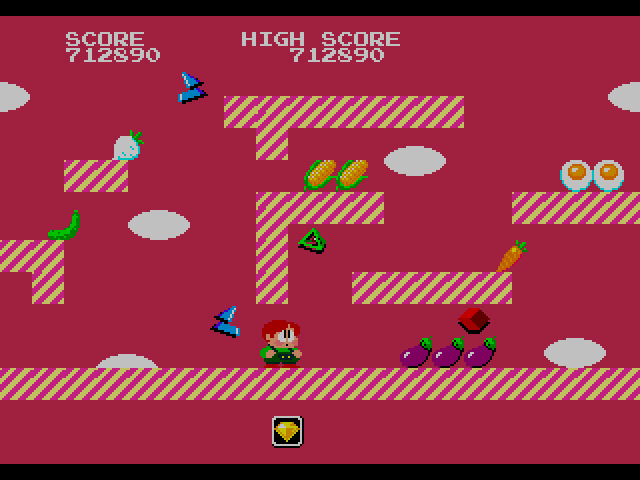 Though marketed as a sequel to Bubble Bobble, the games have surprisingly little in common. The dark oppressive cave dwellings of Bubble Bobble have been replaced by blindingly colorful backdrops. Bub and Bob return, but as Bubby and Bobby, pudgy children from Anytown USA. They use rainbows, not bubbles, to turn their foes into miscellaneous items, and as stepping stones to ascend to the highest heights of each stage. That’s right, Bubby… grow large with food. Upon first glance, Rainbow Islands appears deceptively simple. There are seven islands with four stages each. 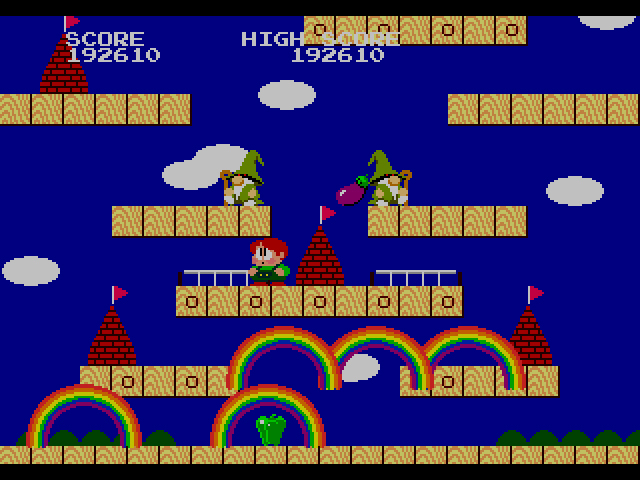 You jump and use rainbows to climb as fast as you can to the top of each stage, killing creatures along the way. 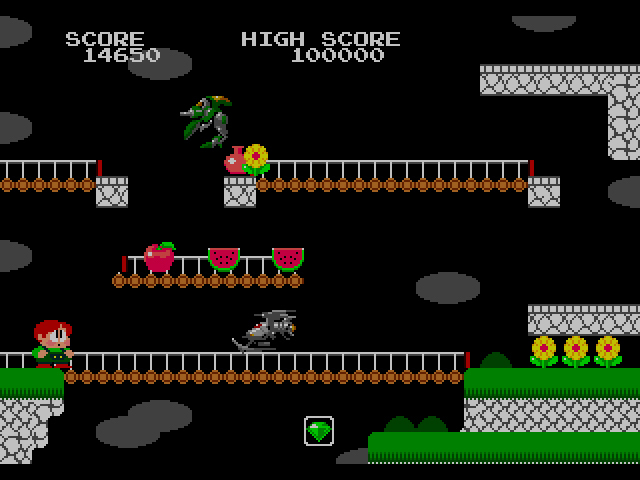 Each stage has miscellaneous fruits, meat, and treasure just lying around that can be collected for points, and enemies also drop various items that also have point value. Collect all the points, defeat Dark Shadow, rejoice in the power of rainbows, amen. As in Bubble Bobble where the game’s true ending could only be unlocked by beating it with two people, in Rainbow Islands, the true ending is revealed only after you unlock and beat the three hidden islands. To do this, you collect seven diamonds of varying color across the initial seven island’s four stages, then beat each boss, who will drop a giant diamond. Once you gather all seven giant diamonds, the three hidden islands will unlock and you can take them on in earnest. But first, a fight with the dreaded Fisher-Price demon. The seven small diamonds are not always easy to come by. To collect them, you kill enemies with your rainbows and hope their corpses land in a certain section of the level. If they land in the right spot, a diamond will appear. 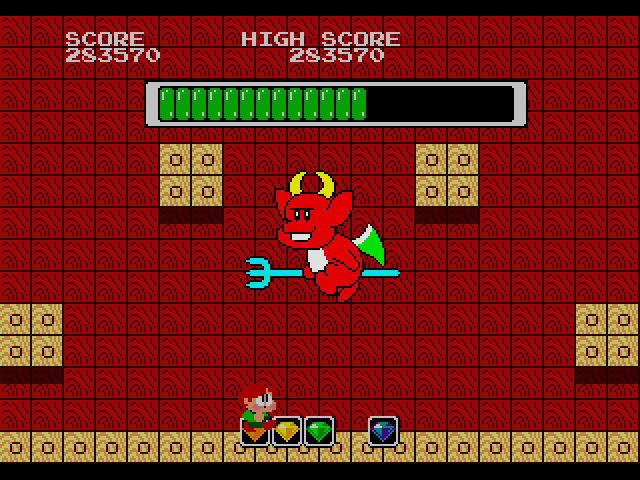 Each stage only has a certain number of enemies, which limits your chances to find them. Also, when you kill an enemy, they don’t just fall down dead on the platform. They spin and sail through the air, sometimes landing far from where they were killed. The stages seem quaint at first. Frowning caterpillars and other slow-moving, cheerless spiders and ants make their way towards you, easily conquered by your rainbows. Picket fences adorn each platform, as if to imply, yes, the Rainbow Islands are safe and simple suburban living. Platforms are prevalent, so using rainbows as a means to climb the stage isn’t necessary. The “Kids, eat your vegetables” programming has never been stronger. After about the second island conquered, Rainbow Islands slowly peels back the cheerfulness to reveal the game’s sinister underbelly. Enemies – from flying Popes who shoot little popes at you, to squirt guns, to pig warriors – appear in droves. Portions of each stage remove all platforms entirely, leaving nothing but large chunks of blue sky. This requires you to link chains of rainbows together without missing a beat. Failure to do so means plummeting downwards and losing large chunks of time. And despite the seeming lack of time limit, when you take too long, the game screams at you to hurry. 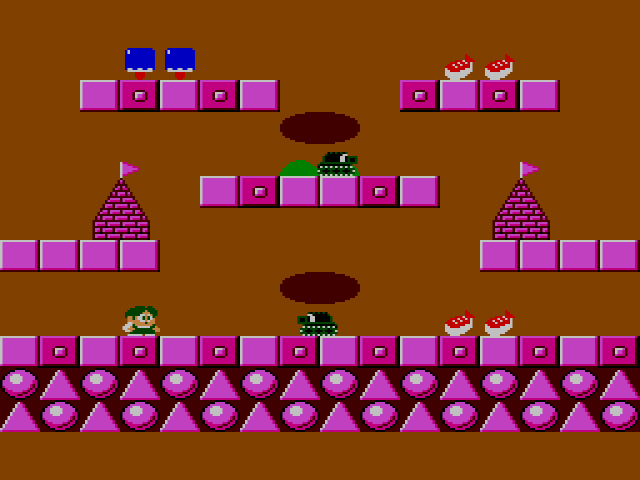 If you don’t hustle Bubby’s chubby buns up to the top, you’ll be swallowed by waves that emerge from the bottom of the screen. Truly, the Rainbow Islands are a vindictive, spiteful paradise. 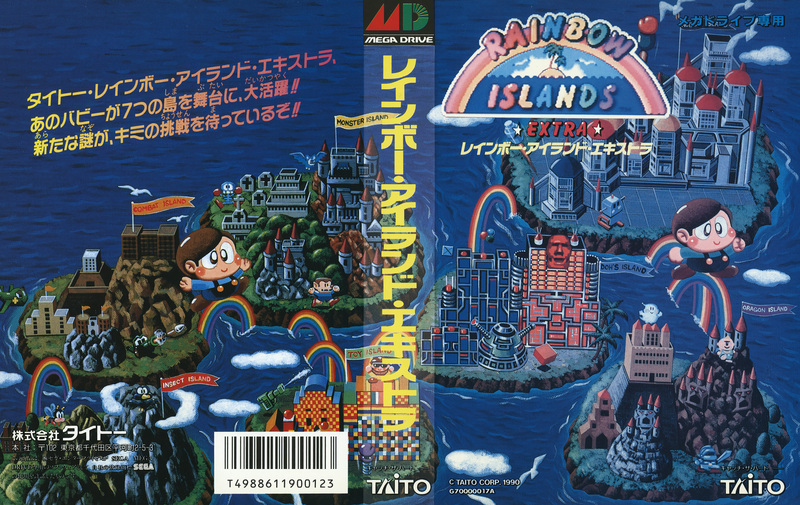 Rainbow Islands, as run by Dr. Robotnik. To help you with the carnage, items are everywhere. Not just foodstuffs to fill little Bubby’s gullet, either (although there’s plenty of them and you should collect them all). Yellow and red stars will turn any enemy they touch into diamonds. Red potions extend the size of your rainbow, up to 3 times. Fast boots make you hustle, yellow potions help you craft rainbows faster, and crystal balls turn enemies into Bubble Bobble enemies upon their death. That’s the Pope’s beer and don’t you forget it, Bubby. 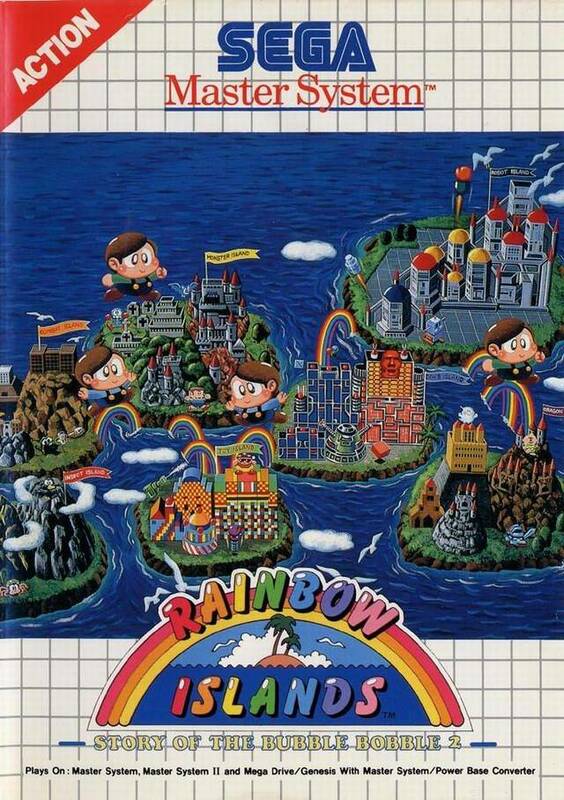 The name Rainbow Islands and the general “It’s A Small World” feel of the game had to have kept male players away back in the late 80s. No way any wannabe macho American teenager was touching this arcade cabinet, at least when his friends were around. Those that risked being called offensive epithets by their friends were rewarded with an experience that decimates Bubble Bobble. 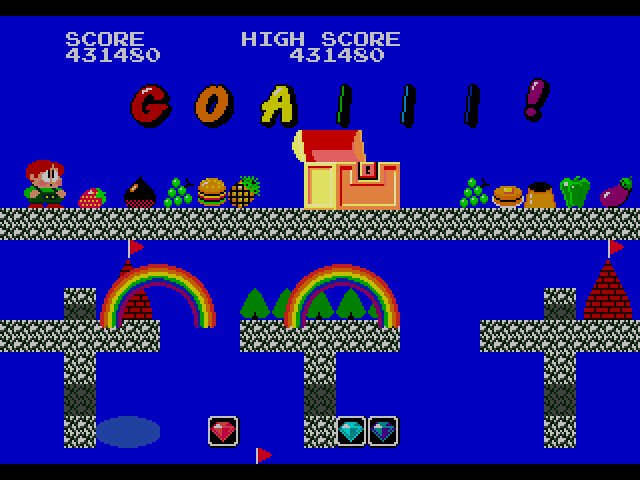 Rainbow Islands Extra is bizarre and surreal and somehow gets more addicting the more you play it. Making rainbows just feels good – the more rainbows I made, the more I wanted to make. Each island has a fun theme, like Insect Island, Toy Island, Robot Island, etc, while the enemy design corresponds to each theme. The replay value is fantastic, as well. Beating the game once without worrying about collecting diamonds is probably a wise idea. Once you’ve harnessed your inner rainbow warrior, you’ll be playing and replaying stages to collect all the diamonds and see those hidden islands. Those nutter butters are no match for the dreaded Triple Rainbow. 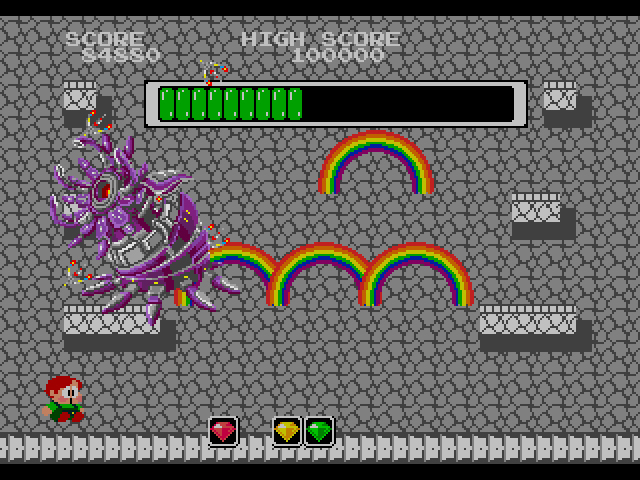 Rainbow Islands Extra does come with an “Extra” mode, which rearranges each stage’s enemies and bosses and places them in a different order. It’s nothing special, but for those who have played through the original game, it’s neat. For the purists among us, you can also play the Original game, but you have to switch to it in the Configuration menu. Bubby’s sharp detour onto Cthulu Island ended in tragedy. It’s a shame that Rainbow Islands Extra didn’t make the trip out of Japan. This is by far the best version of Rainbow Islands I’ve ever played. It’s nearly arcade perfect, includes the three missing hidden islands which were usually excluded from other home releases, and features the Extra mode, which was, until this port, a limited arcade release. You need nothing more, friends. Bubby and Bobby might look like dorks, but their vacation spot is first-rate. Rainbow Islands Extra is brilliant and deserves all of your patronage. 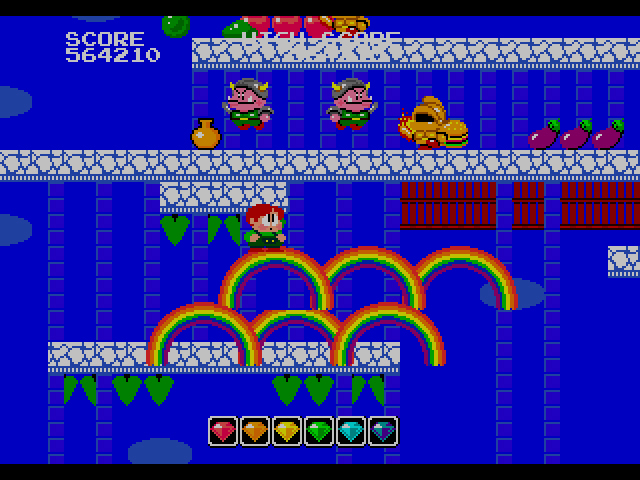 No rest for the hungry, as Bubby and Bobby’s colorful adventure makes its way to the Master System. This port resembles the NES version more than the Mega Drive version, albeit with sharper graphics. The Extra mode is gone, there’s only one hidden island as opposed to three, and there are additional items, like the Star Rods, that turn Bubby into an enemy-destroying machine. If you want to see the extra island, you still have to collect seven diamonds, but they’re more difficult to unearth here. Enemies, once killed, fly more haphazardly around the screen than in the Mega Drive version, so it’s not as easy to predict where they’ll land. Even Bubby’s shocked by the bright pink and chocolate. The Master System’s anemic catalog could have used Rainbow Islands‘ presence in ’90 or ’91, but perhaps because of Nintendo’s strict licensing regulations (the NES version released in June 1991), the game didn’t make its way to Europe until June 1993. Even for Master System fans in other territories, this was a pretty late release, but at least the port they received was of good quality. Good review, never realised that Rainbow Islands had so much depth. Always preferred Bubble Bobble myself, as Rainbow Islands gets fiendishly difficult. The Master System version is pretty uncommon even in Europe. The box art is dreadful too – it looks like it was rushed out, more like a Tech Toy product than a European release. Things like that subtitle (‘Story Of The Bubble Bobble 2’) is what causes problems with people trying to document the history of Bubble Bobble/Rainbow Islands. Did you hear the recent Retronauts episode on this? Sounds like a continuity nightmare! 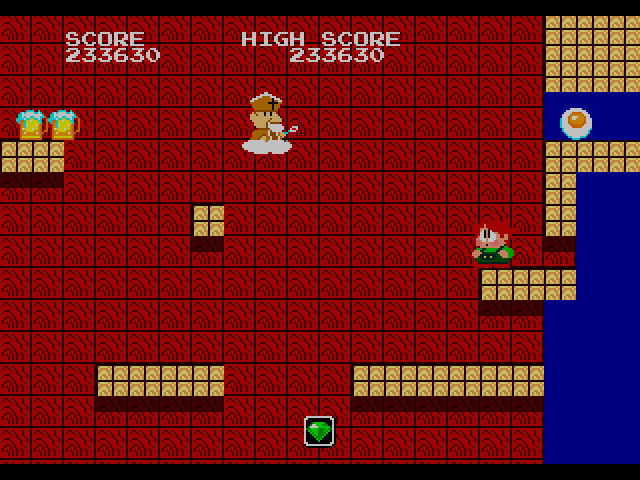 Yeah, the Bubble Bobble series is up there with Wonder Boy in the confusion factor. This is a fun game that I had no idea even existed. Never saw it in the arcade and I was a SMS and Genesis kid in the US. I’m sure I would’ve overlooked this game in ’91 though. I was in my early teens and this was not the look I was going for. Looking back on this game now I can appreciate it for what it is. The Master System version is really nice as well. It seems that Taito of America really thought that American Genesis owners weren’t going to go for the cutesy games. At least that would explain why we never got games like this or New Zealand Story, but games like Space Invaders 91 and Ultimate Qix made it here. Good point! They might have been right, honestly. I typically love the Japanese art direction on Mega Drive boxes, but one thing I’m starting to notice as you go through these is that they rarely have actual screenshots of the game you’re buying, of if they do, you only get one or two. Say what you will about the (usually) ugly American box art, but at least they give you plenty of screenshots. Yeah, it’s a different approach for sure. Genesis boxes would get better over time, thankfully, but I do prefer the sharp art direction on the Mega Drive boxes. I love the subtitle on the SMS box. I could never get into Rainbow Islands though. Bubby and Bobby are just so ugly! The ultra-garish graphics don’t do it too many favours either. I know it has a devoted following so I go back to it every so often to try and click with it. I’m a fan of Bubble Bobble and Parasol Stars though. I feel similarly with Bubble Bobble. It has such a devoted following, yet it never quite clicks when I play it.